The web resource to create a slide show video from a set of photos required the implementation of new features and functionality to improve its performance. The application needed to be redesigned to become responsive and available on multiple browsers and tablet PCs. In order to improve the resource performance, Right&Above professionals worked extensively both on the back-end and front-end of the application. The main technology that we relied upon was Ruby on Rails. We also worked on a responsive web design and new interface to make the application look good on any screen resolution. The next important step was to increase the performance of the service. On the front-end, we integrated an archiving system for old videos, and implemented legacy code and database cleaning function. On the back-end, we added a video fragment cashing system. We rewrote the effects using MLT Framework, which accelerated video generation. Cloud services allow this application to work on multiple machines simultaneously and scale on demand. It makes the overall process more responsive even under a high application load. Using social network integration, we made it possible to share the videos with friends on Facebook or send them via email. We made the Download option available in case the user prefers keeping the video on a personal computer. The company also needed to enhance their web representation by creating a marketing website. We developed web pages to help the company reach out to their audience more easily. On this website, users can see the information on the company’s services, partners and its value proposition, API and other developer information, as well as video samples and contact information. A blog with custom styles was also implemented to provide access to the latest company updates and news. 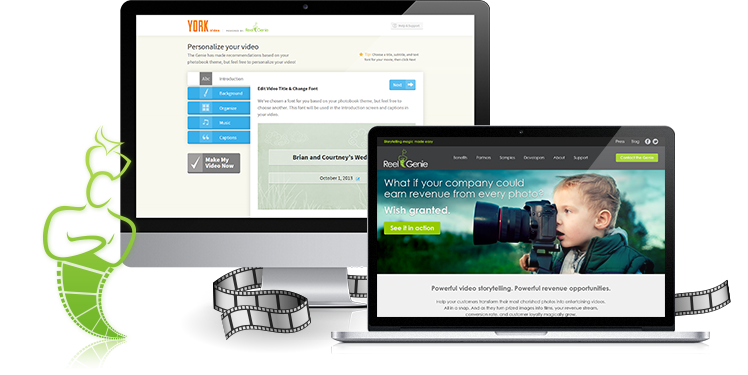 As a result, users enjoy a high-quality analysis, evaluation, marketing, social media and business development tools that turn people’s life stories and memories into captivating movies.